Yusheng is a Chinese-style raw fish salad. It usually consists slices of raw fish, mixed with shredded vegetables, fruits and a variety of sauces and condiments. Yusheng means raw fish, but it’s pronounced the same as another word that means increasing abundance, which is why raw fish salad is eaten on Chinese New Years. 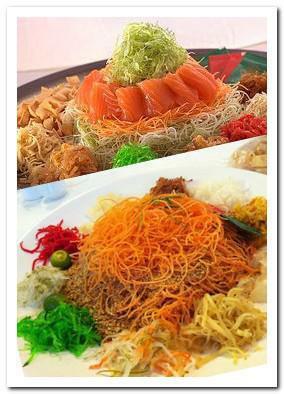 Yusheng is popular in Singapore and Malaysia during Chinese New Year. For the dressing, mix all dressing ingredients in a small saucepan, bring to a low boil. Remove from heat and let cool before use. Arrange fish slices in the center of a large platter. Arrange radish, carrot, bell pepper, cucumber, pear in sections around the platter. To serve, sprinkle pickled ginger, grapefruit, five spice powder, peanut and sesame over the whole platter. Pour dressing evenly over all ingredients.